Recorded at Chipping Norton Studio, Oxon except track B4 & B5 recorded at Courtyard Studio, Oxon. "0777 7 814091 7" appears on the back cover, on the inner sleeve and on the spine; also as the barcode number. "7814091" appears in small print on the labels. "PCS 7360" appears prominently on the labels. Comes with a printed coloured inner sleeve. This release is a repress which came shortly after the initial UK issue in 1993 on the Parlophone label. Matrix / Runout (Side A (etched)): 7814091 1A1 PCS 7360 COME TO FLORIDA!! This is a fantastic pressing. I would say this repress is the best sounding version of the album. Clean play the whole way through with a natural soundstage. It looks as though this is a mispress (per w4toosh 's comment below) as the label clearly has the 45 Parlaphone label. I've tried to do some digging on this and so far, according to the website Cvinyl.com (http://www.cvinyl.com/labelguides/parlophone.php) the generic Parlaphone label changed to the format we see on the early Radiohead realeases in the 1990s. From further checks on those releases on Discogs and 45cat (www.45cat.com.record) it is clear that the large 45 only features on 45rpm records. 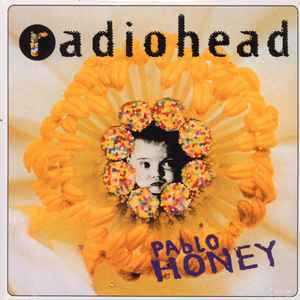 However, the 45 on the label for Pablo Honey does appear to be relatively common as a mispress. In addition to this pressing, it can be seen on the 1993 Capitol (US) pressing (https://www.discogs.com/Radiohead-Pablo-Honey/release/6523112), this has been repeated on the 2008 from the vault pressing (https://www.discogs.com/Radiohead-Pablo-Honey/release/1635232) and the 2015 coloured vinyl reissues (http://thevinylfactory.com/vinyl-factory-releases/most-collectable-radiohead-vinyl-editions/). And it is also on another UK variant pressing from 1993 (https://www.discogs.com/Radiohead-Pablo-Honey/release/7975046). So while I think you're right that this is a mispressing in the technical sense that the 45 should not be on a Parlaphone LP label, it does seem to be a 'common' variant for pressings of Pablo Honey. With a big 45 Parlophone label I would suggest it is a mispress. Only the 45rpm singles had those labels. My copy matches the Matrix/Runout info but this entry does not indicate what year this was pressed. Also note that the vinyl is NOT 180 gram, which indicates it is not a recent reissue, or a "From the Capitol Vaults" release. All other signs point to an original/early UK pressing, but we have no confirmation here. Anyone able to shed some light here?